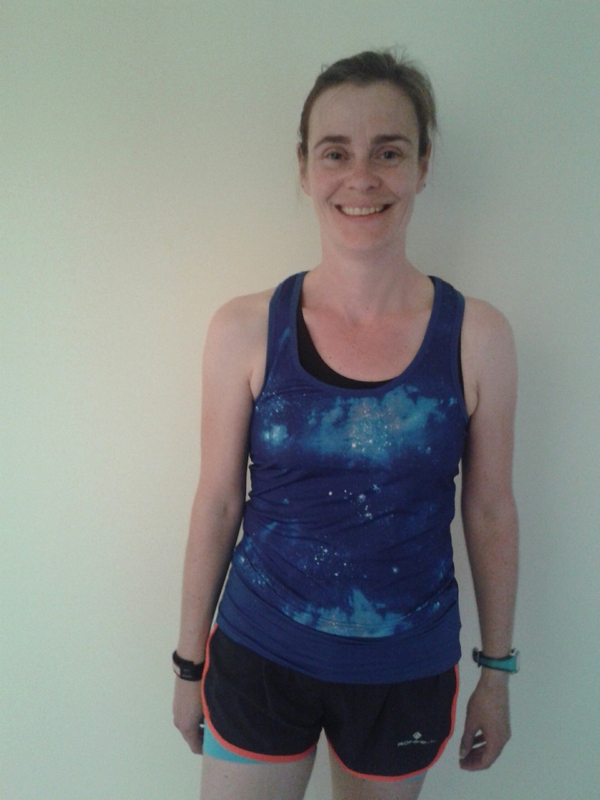 I was lucky enough to speak to Kate Giles recently as her company Crewroom are pleased to launch not one, but two new ranges of running (and sport) gear. They are covering all bases, with ranges aimed at urban landscapes and also more natural settings; featuring bold colours and more subtle tones; suitable for city running, night running, trail running, paddle boarding, yoga, and even for a pint at the pub. This is what Crewroom say about the ranges, but I wanted to test this out for myself. The new ranges are called Elements and Laser. Elements has a breezy natural feel. The fabrics are soft and supple, feel like cotton but are actually fully technical so they are easy to wear and move in. Laser has a more urban look to it, apparently targetting ‘city runners’. It has bold colours with hi-viz reflective panels. Part of the Laser range, this vest says ‘racer’, and Sprint is a very appropriate name for it. Black and Tabby Says this felt very lightweight when I first picked it up, and if I didn’t know better I might have thought it was a cheap garment. However as soon as I started running on a hot and humid evening I was very appreciative of the lightness to this vest. It made my sports bra feel too heavy! 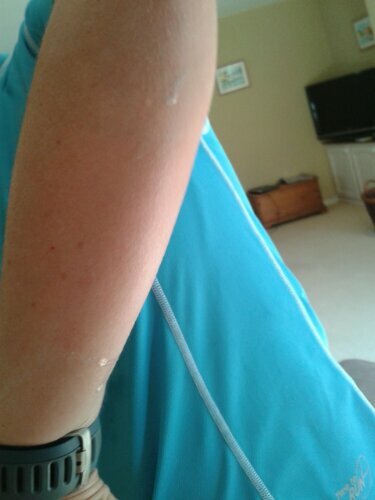 It is cut fairly high at the front which means I wasn’t worried about getting the front of my chest sunburnt, and the armholes were cut to reveal quite a lot of shoulder. On the plus side this made for a cooler run, on the negative side I did feel like I ought to start doing some shoulder exercises if I was going to show them off in this vest. The Vapour-X logo on the front hem feels large, plasticky and clunky and I wonder why they put it here?”. 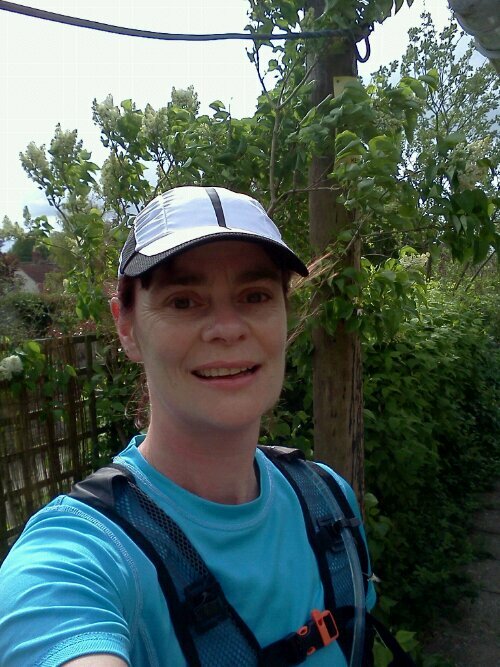 “I’m not used to wearing a vest when running, which probably explains why I felt a little exposed wearing it. 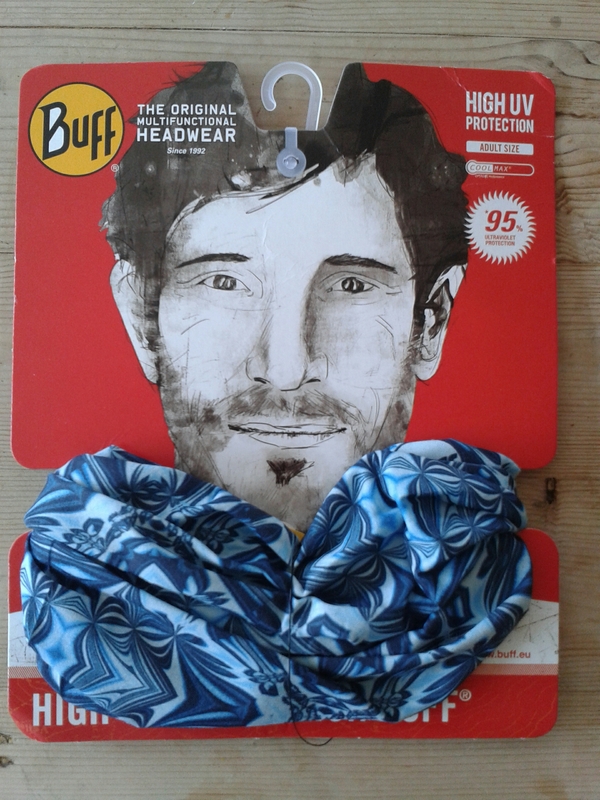 However it was light, cool and comfortable to wear and it will definitely be worn again”. Update – I wore the vest again on another hot and humid run, and loved it. Light, comfortable, airy- what more can you ask for! The only thing I don’t like is that logo on the front hem. The shorts are proper short runing shorts, with a split side seam (just for the bottom few centimetres) and a brilliant flash of colour down the side seam. They have a good sized zipped pocket on the back, and a smaller ‘key’ pocket inside. These shorts are short, there’s no getting away from it. The split sides put me in mind of a proper speedy racer and I had this image (on the left) in my mind as I ran. This was actually no bad thing, as it meant I felt I had to push hard all through my run, even when (especially when) overtaking a dog walker up a hill. Update I wore these shorts again today on another hot and humid run, and I didn’t even notice the bagginess I did on first wearing. I also didn’t notice the split sides. However, like the Sprint Vest, I did notice how light, cool and comfortable they were to run in. I also forgot to mention the splash of colour down the sides which I really like – not too in-yer-face but just enough to brighten what could be prettty plain shorts. 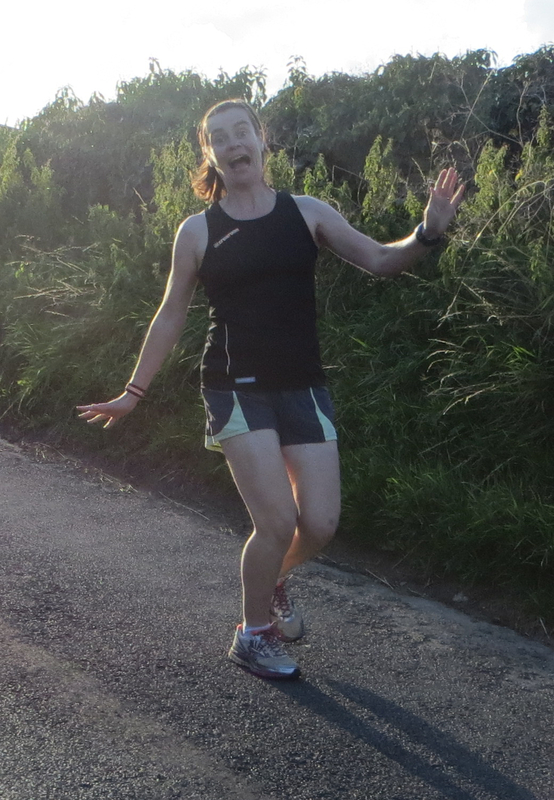 My son took this photo of me running in them, and it has been universally agreed they make me look very sporty and smart. Miracle shorts then! She kindly took note of my “I don’t like pink!” request, and sent me a pair in a lovely “Blueberry/Lime” colourway which turned out to be a bluey-gray with a pale lime highlights (not as bright and hi-viz as I’d have thought). Kate Giles, founder and CEO of Crewroom said “when you handle the Elements fabric, it feels like cotton, it has that softness. You know you’ll be able to train in it for a long time.” Kate prefers to wear this is this very hot weather, but knows that some people do prefer the more technical feel of the Laser range. She believes Elements is fine to wear to train in, and then wear down to the pub. Black and Tabby says “When I unpacked these shorts I wasn’t sure that they were a technical fabric because they felt so soft and stretchy. 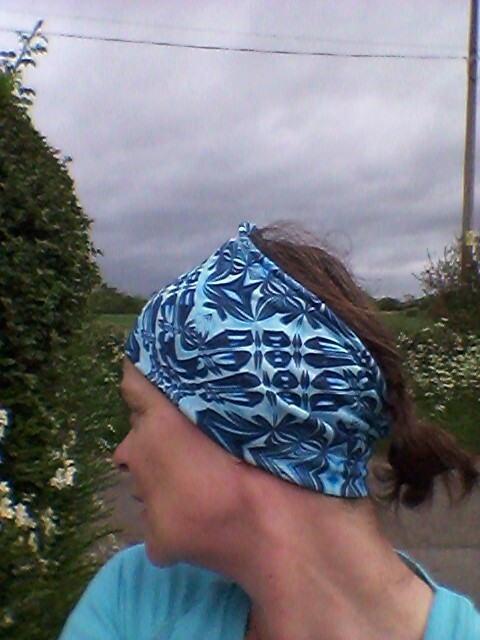 I also wasn’t sure about the wide waistband – was it going to dig into me as I ran? 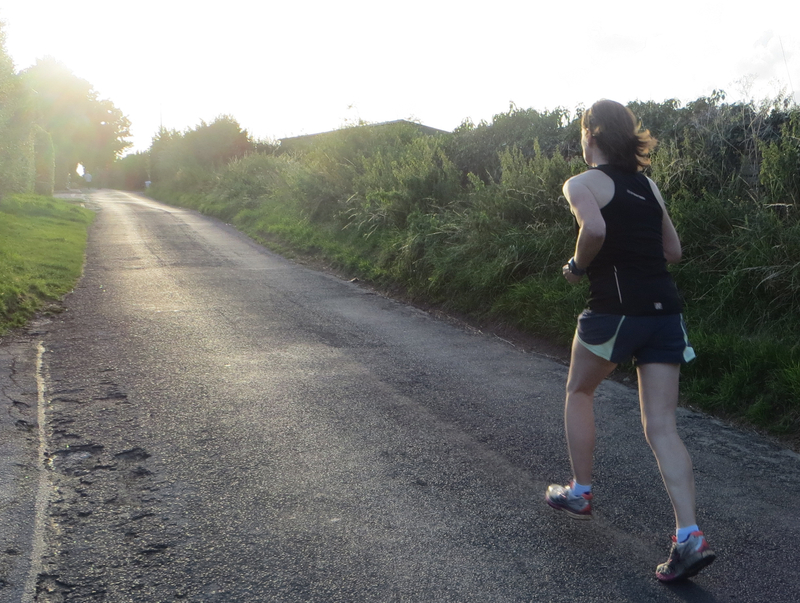 As I have no waist (I sadly go straight up and down) I do have problems with belts and waistbands riding up as I run. Despite these misgivings I put these shorts on and shot out for a short run before I went away on holiday. After initially fidgetting with the waistband I was impressed to find it was comfortable. 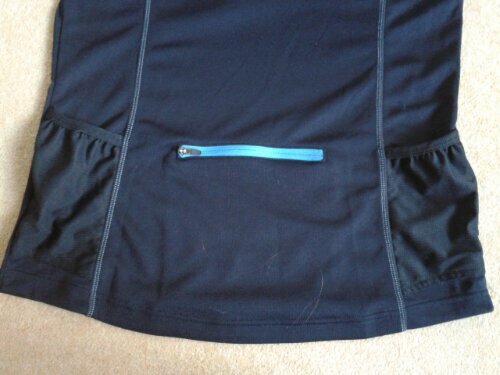 If you’ve ever run in any shorts or trousers where the waistband has slipped below a vaguely wobbly tummy you’ll know how unsettling this feeling is. These shorts don’t do that. Even with my phone in the back pocket they felt secure without being constricting, and despite my lack of waist they didn’t ride up and give me a ‘wedgie’, so they scored highly for that. As I ran they simply felt cool and comfortable. How many shorts make you run like this? It’s obvious I love these shorts. I’ve worn them for another two short runs and they’ve performed brilliantly both times. The only negative I can find for them is that, unlike the Laser Trail shorts, they don’t have an integral lining so you either need to be brave enough to run ‘commando’ or you need to find the perfect running knickers to go underneath (something I’ve yet to do). I guess this is so that you can wear them for activities other than sport but that would have made them my 100% perfect pair of shorts. As it is they’ll have to have a score of 99% I look pretty happy with them though! Please Note – I received no payment for writing this review, but I did receive the shorts and vest for testing purposes. All views and comments are my own. Picture the scene. Wimbledon 2011, World class tennis is being played, the sun is shining, the strawberries are over priced and I’m lucky enough to be there. I’m handed a plastic glass full of Pimms and ice, which I’d never tried before, but which looked delicious. I take a cautious sip. I’m not immediately bowled over by the taste. I gently swill it round my mouth and make little lip smacking ‘tasty’ noises and try to decide if I like it or not. I take another sip and repeat. Another sip, more lip smacking, more deliberation. Finally I reach the bottom of the glass and decide that, all things considered (not least that I’ve drunk every drop and am now starting on the fruit), I did enjoy it. 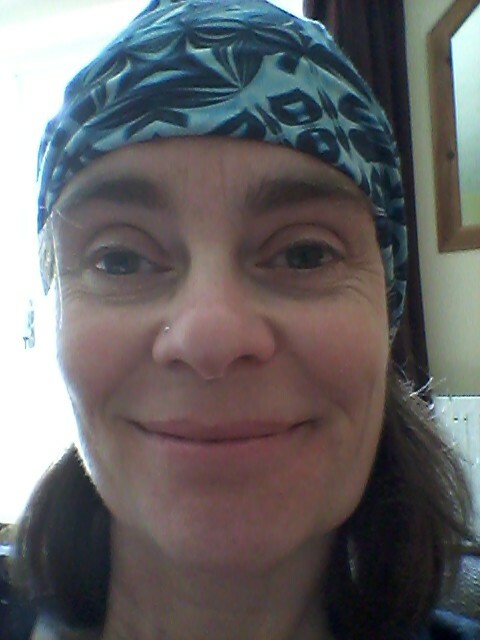 Fast forward two and a half years, to find me stressed having not run since the Running Show 10K 10 days ago, surounded by builders’ noise and dust. On an impulse I decided to run away from the chaos for just half an hour. I also decided it would be a great time to road test the bag of goodies I brought home from the Running Show. 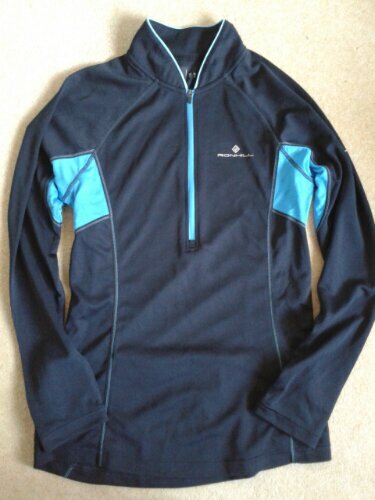 I grabbed my new Ron Hill long sleeved top which I’d bought for half price at the Running Show. Although I have several (cough cough) long sleeve tops already, I was drawn to this one because it had useful pockets on the back, like on a cycling jersey. It also had a very special zip neck. With all zip up tops (and jackets and gilets) I’ve had before, as soon as I undo the zip I find the edges of the collar really annoying and flappy. I end up having to tuck the edges in to stop the flapping, which isn’t attractive. This top though, has curved edges at the top of the collar, so I’m hopeful it won’t flap. I love new socks, and had been delighted to find a pair in my Goody Bag from the ‘Write This Run’ conference. I read another attendee’s blog (Lucy Lemon) who said that having tried on her socks she ‘may never take them off again’ so I had high expectations that they were going to be comfy. With size 6 (and a bit) feet I was hoping the medium size would be big enough, and they did fit very nicely. They were padded nicely around the tops, heels and toes which was looking good for keeping my feet warm on a cold Autumn day. They did come quite a long way up over my ankles which might bother the sort of people who love ‘anklet’ socks (you know, the sort that disappear inside your shoes as you’re running and you have to stop and retrieve them), but was fine for me. I also pulled out the packet of Bonders which I’d found in my Goodie bag from the Write This Run conference. Reading the instructions these little pieces of Velcro are designed to hold your laces down so they don’t come undone whilst you’re running. I laced my shoes up, then looked at the Bonders. They sound like a good idea, but by the time I’d knotted my laces I didn’t have long enough ‘loops’ to be able to use the Bonders to strap them down to my shoe. Then I realised that if I did have long enough loops, I would probably just tie my laces in a double knot anyway. Instead of my faithful waist pouch I popped my phone into the zipped pocket of my top. As I set off, I could feel it jiggling and bouncing slightly, and just as I thought it was going to be too annoying to leave there, I was distracted by something, and then forgot all about it. I only remembered it was there when I had to stop to answer my phone and it was easier to extract than having to rumage under layers of clothing. I found the other pockets very useful for stuffing in some litter I found on a pristine footpath (the Wombles would be proud of me.) As the weather gets colder I can see these pockets being great for discarding gloves, hats, ear warmers etc as I warm up. 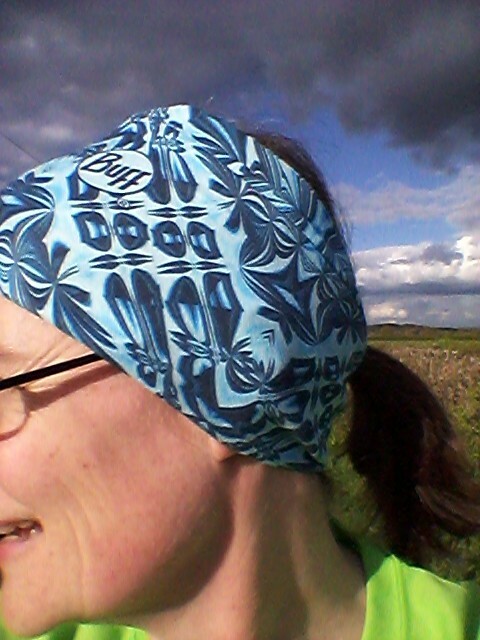 The small hill after a mile and a half was enough for me to need to undo the zip a little and let some fresh air in. 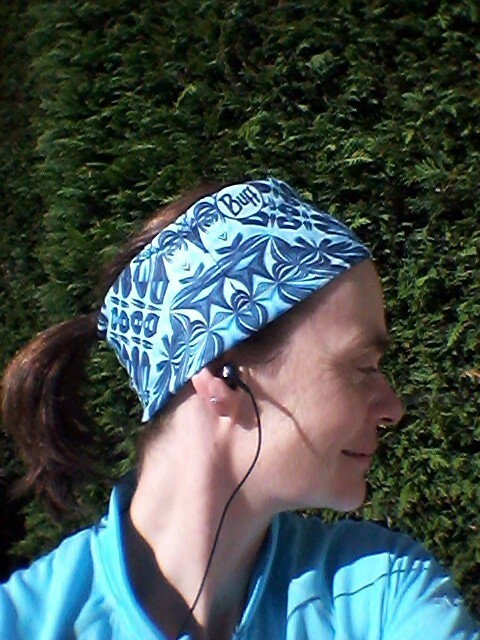 Amazingly, this resulted in no annoying flappage, even when I undid the zip to about halfway, The zip is long (undoing it fully would reveal most of my sports bra) so there is plenty of ventilation if I need it. And don’t mind flashing my underwear. Talking of underwear, after about a mile I had suddenly become aware of the underside of my socks. The socks have lovely thick sections under the ball of the foot and the heel, and a tighter thinner section around the innerstep. I could suddenly feel the edge of one of these sections. I have had this with other socks so I suspect I get this when my feet are cold, and sure enough after another mile the feeling disappeared. For the rest of my run my feet were lovely and toasty until I hit ‘that puddle’ at 5 miles. As I felt the cold puddle soaking into my socks, my thoughts turned to what was waiting for me at home. Not the builders with their associated dust and noise, but a sachet of ‘Apres’ Chocmalt hot recovery drink. I usually have a hot chocolate when I get back from a run so I was intrigued to see what chocolate and malt tasted like, and to see if I felt better after a ‘proper’ recovery drink. Squelching around the kitchen I mixed the powder with hot water, and took a sip. I swilled it round my mouth and made little lip smacking ‘tasty’ noises to try to decide if I liked it or not. I took another sip, unsure whether I like it or not. Suddenly I am back at Wimbledon again, sipping and tasting. The Chocmalt isn’t as sweet as hot chocolate, but this means I didn’t feel so guilty about drinking it. It would also appeal to people who aren’t used to such sweet drinks. It feels very satisfying to drink and would be wonderful to have after a cold, wet trail race. Like the Pimms two and a half years ago, I reached the bottom of the cup still smacking my lips, and decided I did like it. Yum! Ron Hill Top – I loved this top. Great fit, thoughtful design around the neck, and useful pockets. Its on the top of my pile of running clothes, ready to be put straight back on. 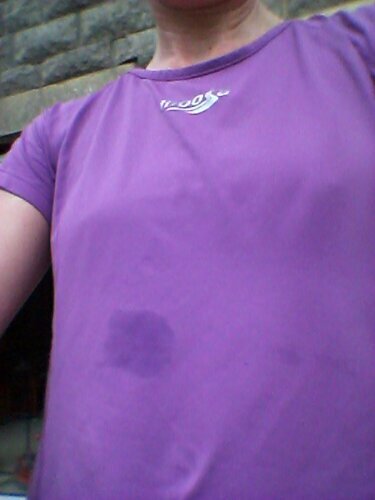 I *think* this top is a ‘Ron Hill Ladies Trail Long Sleeve Zip Tee’, but mine didn’t have the labels on. Ron Hill’s website is here, and their stuff is available from all good sporting outlets. And some bad ones. Probably. 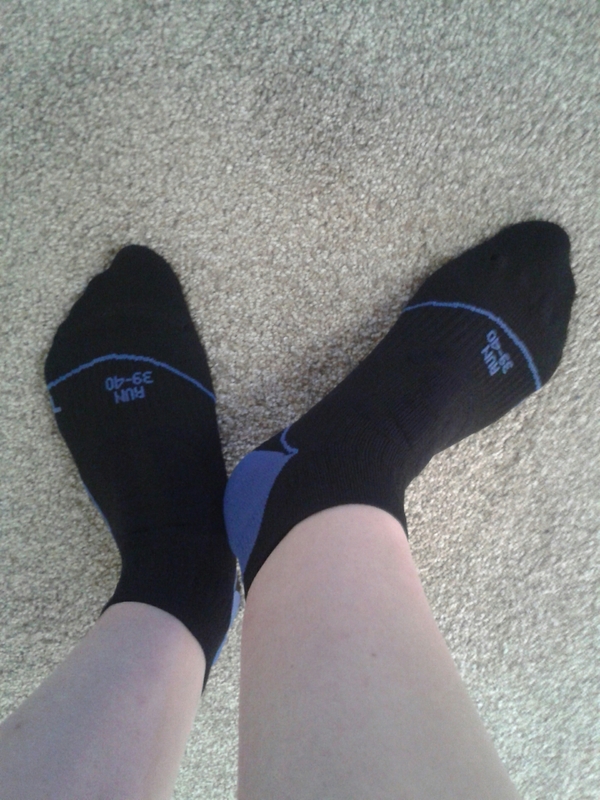 Balega Socks – Again, I loved these socks. Tight enough not to rub my feet, but not constricting. Long enough so I don’t get that cold gap between tights and socks. These are my new favourite socks, which means they will soon be a sad grey ‘mud stained’ colour. Company website is here, but I’m sure they’re available from all good sports retailers. 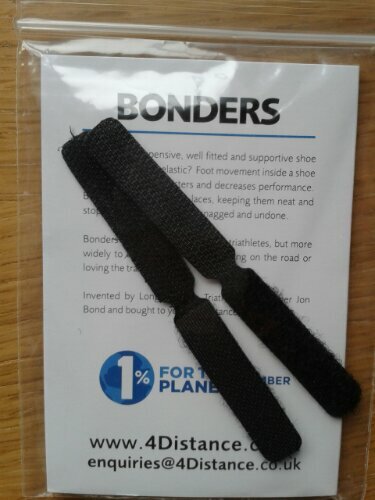 Bonders – Just didn’t work for me,and I can’t see how they’re better than double knotting your laces. 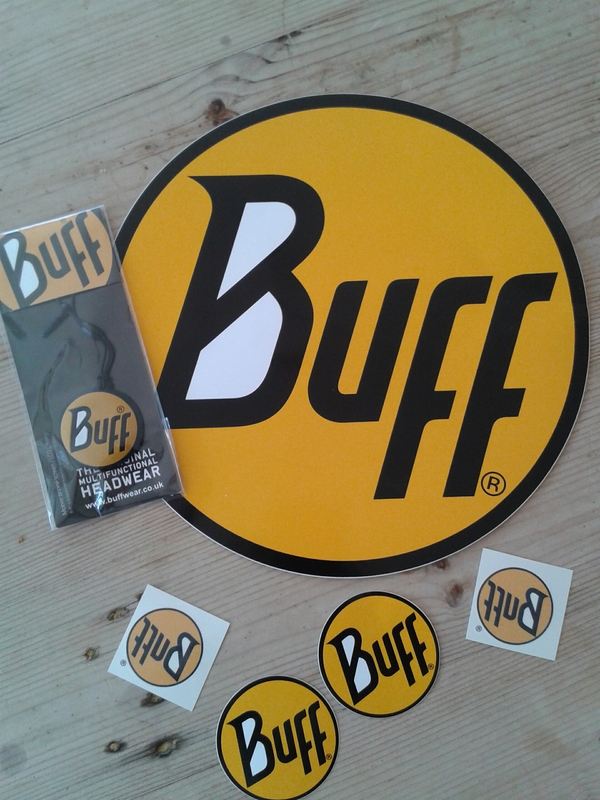 Available from www.4Distance.co.uk if they’re your sort of thing. 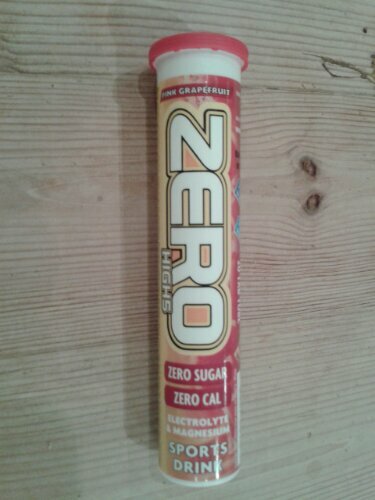 Après Hot Recovery Drink – Much tastier than I thought it would be, but at £1.99 a sachet a little expensive for everyday use. 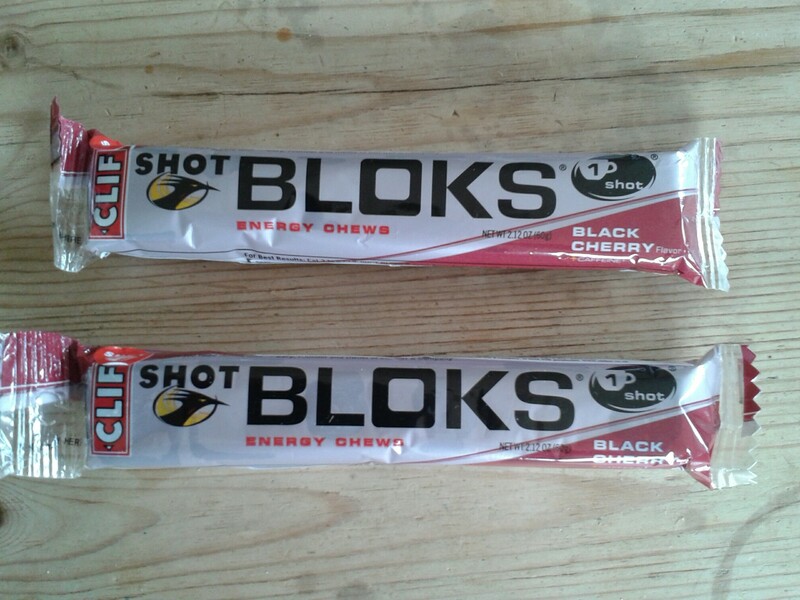 I will buy some to take to races, with a flask of hot water and a mug, to enjoy before the drive home. Check them out here. 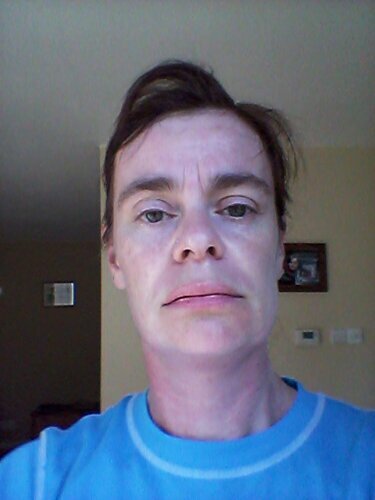 Please Note – with the exception of the Ron Hill top, which I paid for myself, the other products were all given free of charge, and I have received no payment for this review. 3 Stars = How have I lived my life up to this point without this? 2 Stars = Pretty good, but I’m hard to impress. 1 Star = Not for me. Someone else maybe, but not me. No Stars = What were they thinking of?